The best of Game of Thrones knitting. Winter is coming. So you’d better start knitting. Dude, where’s my yarn? Ashton Kutcher knits mutant onesie in latest Lenovo television ad. The unlikely resurgence of pixel art. Can a cross stitch renaissance be far behind? And speaking of a cross stitch resurgence, I love the Red Gate Stitchery Etsy shop because it’s doing something different with cross stitch. These little necklace, cuff, and earring kits would make wonderful introductions to cross stitch for beginners — big stitches, quick results, and a tangible, wearable reward at the end. 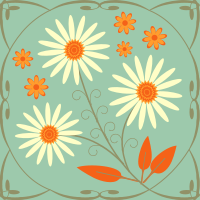 The designer’s home page even has a “Resources” link with a cross stitch tutorial for beginners and downloadable templates so you can chart your own designs. 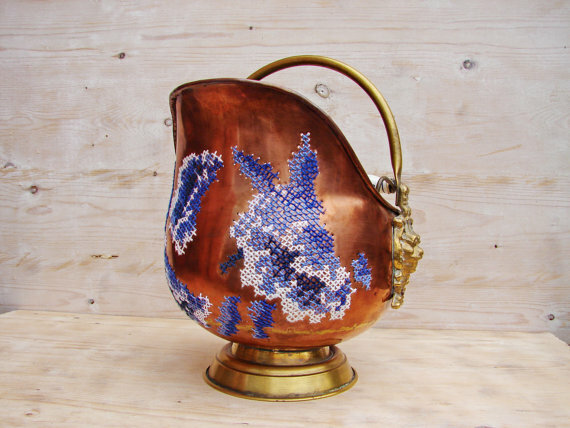 This Etsy shop, stedi, is also doing some colorful and unusual things with cross stitch and wood, and even copper (see below). On a personal note, I have this some copper pot. My mother brought it back with us from Germany where my father was stationed in the 1970s. I have to admit it never would have occurred to me to decorate it with delft blue cross stitch but I admire the kind of “thinking outside the box” that this crafter promotes. 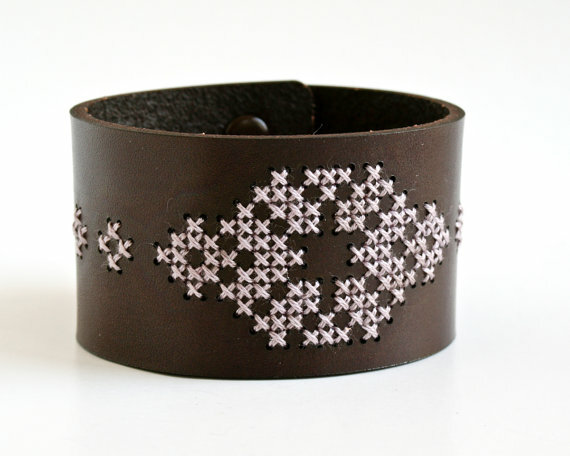 It’s hard to think of new ways to display cross stitch. 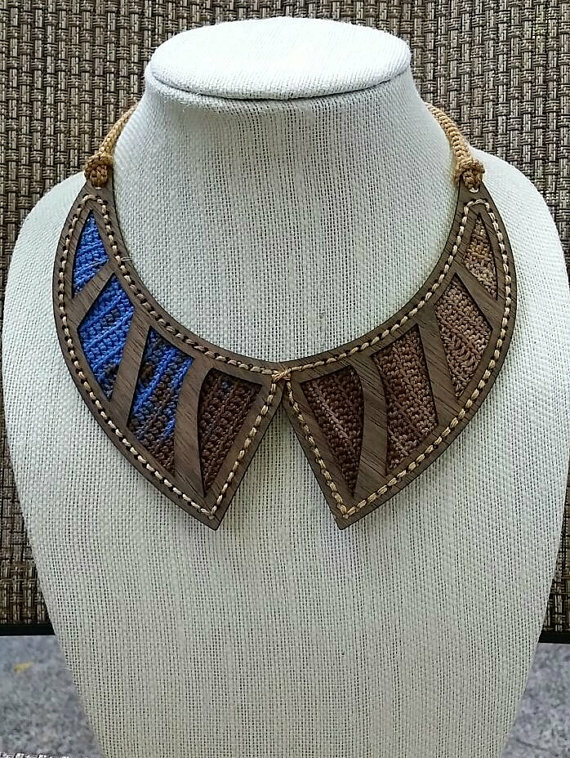 And I just stumbled upon another Etsy shop, eWood Story, that’s selling some very unusual and beautiful Art Nouveau-style necklace kits featuring a combination of woodwork and crochet. More photos are available on Websta. And in my own stitching universe… I have started my October project for the 2014 Smalls SAL (icon in the right-hand column). I chose “Not Forgotted” by Plum Street Samplers, from the 2012 Just Cross Stitch Special Halloween Issue. Actually, interesting side note — the chart is actually not available in the Just Cross Stitch issue because it was somehow accidentally left out. Just Cross Stitch used to have a special page on their site where you could download the missing pattern, but that page seems to have disappeared. I happened to have downloaded the pattern just in time. If anyone out there knows where to find it, let me know and I will pass the information along. Thanks! That’s it for now — I hope you enjoy the new spooky look. Happy stitching to everyone! That Red Gate site has some cute things. I especially like the animal silhouettes. Yeah, they are quite adorable. I’m really interested in finding some unconventional uses for displaying cross stitch. You can only frame so many pieces… unfortunately.